Only the neck is left to do. Not sure what we’ll do with it. Jean said to bring needles in a variety of sizes to the next class. So far I’m satisfied with the results except for the 1×1 rib along the bottom edge of the body and sleeves. If you look closely (click on the photo) you can see how loose the stitches are. It looks sloppy even though I did use a smaller needle size. I’m sure a 2×2 rib would look better but I really had no choice in the matter. On each sweater we’re learning specific finishing techniques and for this sweater one we needed to learned how to do an invisible bind off for 1×1 rib in the round. I’m hoping it will look better after a little blocking or steaming. Here are my finished vest pieces (front and back) laying folded in half on top of their corresponding life-sized patterns. Notice the grids drawn on each armhole and neck. We draw them using special rulers that correspond to our stitch/row count. Once the grid is drawn we determine the decrease steps and trace them out using a color pencil. If you’d like to use a similar technique I’d suggest using this grid paper from www.tata-tatao.to. One of our assignments for the last class was to have both pieces (front and back) knitted to the armhole. For the class in two weeks were suppose to finished those pieces plus knit both sleeves. Earlier this week Sophie decided to check my work. Good thing she did. Turns out I hadn’t cast on the correct amount of stitches! On top of that mistake, my attempt to shape the waist by going down a needles sized didn’t quite work for the way I drew the pattern. Unfortunately I’ve spent the past week redoing most of what I had done for the last class. 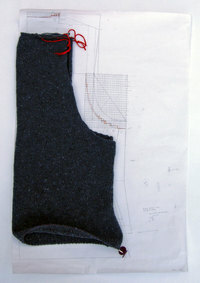 With luck and diligence I should be able to finish the sleeves soon and then I’m free to work on any project I please. At this point I don’t dare let myself get tempted with other projects. Lately I’ve been itching to spin. I’m sure these two would love a change of pace as well. I’m sure your ribbing is just fine. Possibly going down another needle size might have helped, or doing the trick of wrapping the purl stitch the wrong way might have helped. But really, I think your ribbing looks the way it is supposed to look. I am always so impressed with how very clear your photos are on this blog. You obviously have a good eye. You’ll have to let me know what kind of camera you use. I really am enjoying reading about your classes! Thank you for the updates. I admire the focus and thoughtful work that you and your classmates exhibit in taking Jean Wong’s class. Please forgive me when I crack jokes about “Nihon Homework”…I’m expressing awe and, being a lazy knitter, relief that I’m not part of the whole enterprise. I also admire that you are setting aside your “fun” projects in order to meet class requirements. Hats off to the Nihon knitters!!! You go where no lazy knitters have gone before….